1. Archimedes- famous Greek physicist and mathematician who devised the use of method of exhaustion. He is the first to attempt in finding the value of pi and known to his books about spheres. In physics, he was known for his Archimedes' screw and Archimedes' principle. 2. Pythagoras- known for his theorem that in a right triangle, the length of the square of the hypotenuse is equal to the sum of its squares of its legs (Pythagorean theorem) and he is one who introduced the numerology, a type of horoscope according to numbers. 3. Apollonius of Perga- he is famous on his studies on conic sections. 4. Thales of Miletus- Greek philosopher who proved that the triangle inscribed in a semicircle is a right triangle. 5. Eratosthenes- famous in calculating Earth's circumference through shadows and devised the Sieve of Eratosthenes, a traditional method for finding prime numbers by means of listing. 6. Diophantus- regarded as the Father of Algebra and wrote the book Arithmetica, an essential book for algebra. He was known for his equations that bear on his name. 8. Hipparchus- known as one who devised the trigonometric tables using the chords of the circle. 9. Cladius Ptolemy- geographer and mathematician known for his geocentric model and known for his theorem on the diagonals of a cyclical quadrilateral. 10. Euclid- famous author of The Elements which paved way in studying plane geometry. 11. Nicole Oresme- he is known in introducing the plus sign (+). 12. Rene Descartes- French philosopher and mathematician known in introducing the coordinate system which became the basis of analytic geometry. Known also for his modern symbols in radical with vinculum (a bar found at the top) and theories about polynomial function. 13. Christoff Rudolf- the first to introduce the radical sign. 14. Leonardo Fibonacci- known to his sequence 1,1, 2,3,5..... which is known as Fibonacci sequence. 15. Al-Khwarizmi- an Arab mathematician who contributes greatly in Algebra especially law of exponents. 16. John Wallis- known for his definite integrals involving trigonometric derivatives. 17. 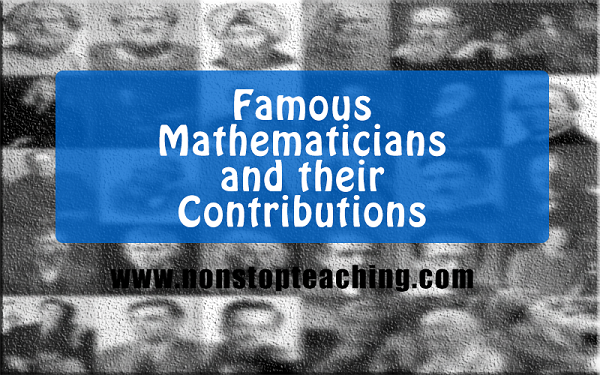 Nikolai Lobachevsky and Janos Bolyai- they are the founders of hyperbolic geometry, a type of non-Euclidean geometry. 18. Benoit Mandelbrot- known for his introduction of fractals, a geometric figure that exhibits self similarity. 19. Pappus- known for his theorem on solid of revolutions. 20. Neils Henrik Abel- known for his Abellian group that is use in number theory. 21. Gabriel Cramer- devised the method of solving linear equations through determinants. 22. Johannes Kepler- a physicist and mathematician and student of Tycho Brahe who devised the three planetary laws and concluded that the orbit of the planets are elliptical. 23. Isaac Newton- one of the founders of calculus who devised the method of fluxions and fluents. the limit of f(x)/g(x) as x approaches to the certain value is equal to the quotient of the value substituted on the partial derivative of f(x) and g(x) provided that f (x)/g(x) is indeterminate. 25. David Hilbert- known for his Hilbert's problem that composes of difficult math problems that cannot be solve. 27. Blaise Pascal- inventor of Pascalline and introduced a special triangle for finding the coefficients of a binomial expansion. 28. Gino Fano- known for his introduction of Fano plane, a projective plane having 7 points and 7 lines. 29. Georg Cantor- he introduced the set theory and some symbols for set theory. 30. Guissepi Peano- one who introduced the symbols for union, intersection, universal and subset. 31. Gottfried Wilhelm von Leibniz- one of the founders of calculus with Isaac Newton who introduce the Leibniz rule and modern symbol for integration, the elongated S.
33. Leonhard Euler- blind mathematician known for his Euler's number (e) and modern symbols for differentiation. He also attempted to find the value of pi and devised the formula for the Platonic solids. 34. Georg Friedrich Riemann- known for his introduction of elliptical geometry. 35. Albert Einstein- famous German-American physicist who was known for his E=mc^2. 36. Carl Friedrich Gauss- the Princeps Mathematicorum who introduced the normal distribution, the congruence symbol or modulus in number theory, a method of finding the echelon of a matrix and first to devised a formula in finding the sums of a given sequence. 37. William Rowan Hamilton- known for his discovery and introduction of quaternions, a type of normed division algebra that involves distinct imaginary parts.